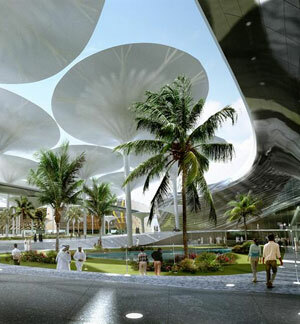 In Biophilic Cities: Integrating Nature into Urban Design and Planning, Timothy Beatley, Teresa Heinz Professor of Sustainable Communities at the University of Virginia, argues that planners and landscape architects must design cities so people feel intimately connected with nature. 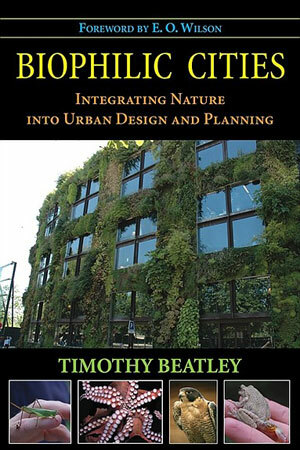 Beatley hopes his book will foster a dialogue about biophilic cities by first defining what these are, offering a set of indicators for measuring biophilic interactions, then imagining how these look at various scales, and finally outlining what institutions and organizations can do to build communities more in tune with nature. Throughout, there’s a strong case for the psychological benefits of urban nature. E. O. Wilson writes in the foreword: “The evidence is compelling that frequent exposure to the natural world improves mental health, it offers a deep sense of inner peace, and, in many ways we have only begun to understand by scientific reason, it improves the quality of life.” Beyond improving humans’ well-being though, fostering biophilia among residents can also increase cities’ resiliency to future changes. What percentage of the population is within 100 meters of a park or greenspace? Per capita, how many miles of walking trails exist in the city’s borders? What is the percentage of time residents spend outside, understanding that climate must be accounted for? What percentage of the population is active in nature or outdoor clubs or organizations? How many of these organizations exist in the city? What percentage of the population can recognize common species of native flora and fauna? To what extent are residents curious about the natural world around them? Has the government adopted a local biodiversity action plan or strategy? Has priority been given to environmental education? Has the government adopted green building and planning codes, grant programs, density bonuses, green space initiatives, dark-sky lighting standards, etc? Overall, the city should be a place that is deeply connected to nature; it breaks the average urban resident’s feeling of alienation from nature. Planners and landscape architects need to mediate and facilitate this process so that we envision our cities as a living environment. With many case studies and best practices, the book offers exemplary ideas for professionals to consider as they re-naturalize the urban world. 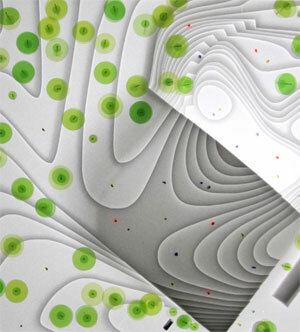 Read the book and learn more about biophilic landscape design. 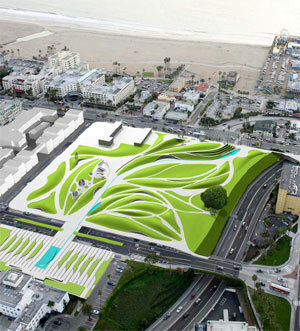 This guest post is by Amanda Rosenberg, 2010 ASLA advocacy and communications intern. 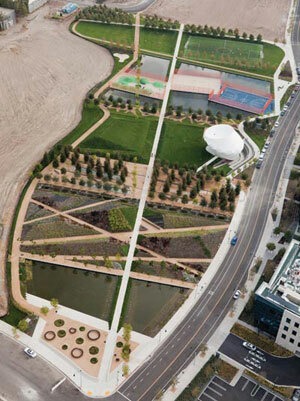 Reprinted from the April issue of Landscape Architecture Magazine (LAM). 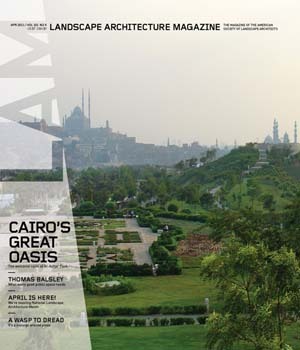 In honor of National Landscape Architecture Month, the April issue is available for free online. For decades, people have bewailed sprawl and demanded that we stop developers from spreading it any farther. While urbanists have proposed numerous alternative development patterns and zoning regulations that might improve the quality of future new construction, there hasn’t been much discussion about the millions and millions of acres that already exist. The attention that has been paid to this existing suburban landscape has been primarily form based, when it should have been concerned with how to change that landscape and should, therefore, have been process oriented. It finally is time for a process-oriented approach, because the existing single-function landscape, created for an automobile-dependent population, is getting steadily older and obsolescent—sufficiently so that we need practical proposals for what should come next and how to make it happen. Because the mid-20th-century suburban landscape is aging, there is an opportunity for second growth. Many single-story manufacturing facilities are closing down, open-air shopping centers find it difficult to compete with big-box retailers and climate-controlled malls, railroads have abandoned once-profitable rights-of-way, and aging office parks with out-of-date infrastructure are being taken out of service. Moreover, development has now leapfrogged into the exurbs, and residents and businesses that once occupied mid-20th-century suburbs are following farther into the hinterland. We need to recognize this mounting problem but think of it as an opportunity to shape what will be inevitable second growth. Underused manufacturing properties, shopping complexes, and office parks can now be purchased by county and town governments in suburban areas and reused as public parks. Some vehicular lanes on major traffic arteries can now be replaced with wider sidewalks, bicycle lanes, and light rail or bus rapid-transit corridors. Some clusters of small, deteriorating bungalows can now be replaced by higher-density residential development. We should seize this opportunity by eliminating single-function zoning, introducing alternatives to private automobile travel, acquiring sites for the development of new public parks, and providing a public-realm framework that ties these communities together. All this can be accomplished once there are models to be used in local redevelopment efforts, financial mechanisms to pay for them, and agencies established to implement schemes for second growth that undo sprawl. The model I propose is similar to what my firm proposed and was adopted by the County Commission in DeKalb County, Georgia. It can be financed through a tax increment district, which uses the increased taxes paid by properties whose value has been increased by investment in the public realm and rezoning to pay debt service on the bonds that would finance the investments in the public realm. 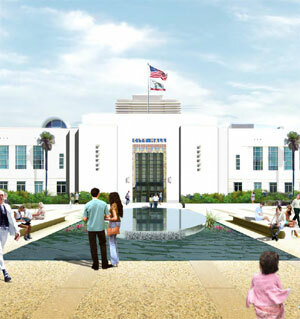 While the money for these public-realm investments would come from bonds, the construction itself could either be done by private developers implementing a government-approved plan or by a redevelopment agency set up for that purpose by the local government. At the start of the 20th century there may have been a rationale for separating land uses. But much of that rationale is now irrelevant. Environmental regulation now precludes the air and water pollution that made it essential to separate manufacturing from residential areas. Similarly, bicycle and light-rail networks in Denver, Minneapolis, and other cities are being extended into the suburbs, thereby diverting enough traffic to reduce the rights-of-way used by motor vehicles. As a result there is a growing opportunity for a major change in land-use patterns and, with that change, major improvements in the quality of life throughout suburban areas that were once decried as sprawl. Alexander Garvin is president of AGA Public Realm Strategists, author of Public Parks: The Key to Livable Communities, and Professor of Urban Planning and Management at Yale University. The Natural Resources Defense Council (NRDC) has launched Smarter Cities, a comprehensive “multimedia Web initiative,” designed to answer the questions: What makes a smarter city? Which cities are smarter? In this instance, NRDC is defining smarter as “more efficient, sustainable, equitable and livable.” Included in this new trove are online resources focused on “leader cities,” selected for their “best practice programs in various components of sustainability”; more than a hundred city profiles; toolkits; and a blog by NRDC smart growth experts. In the same vein, What’s Smart Near You? involves residents of these cities in a broader conversation about cities through a set of searchable databases and useful tools that allow everyone to “locate local goods and services that make all of us and our communities smarter.” One easy-to-use tool enables urban residents to find fresh local foods, while another helps residents locate recycling centers near them. Also, one really nice feature is a map tool that enables you to search for resources by state. There’s also a set of “cities to watch” in this area. Check out your city’s profile and start exploring resources. 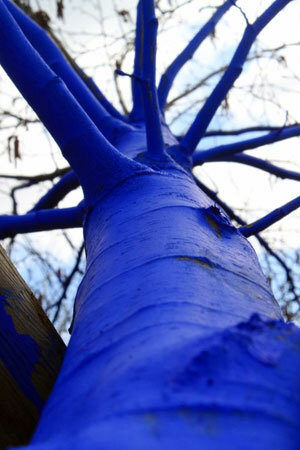 The University of Washington’s landscape architecture department has put together a symposium that will explore the idea of the Eco-City. In “Next Eco-City,” a range of leading landscape theorists and practitioners like Kristina Hill, Affiliate ASLA, Pierre Belanger, ASLA, and Yu Kongjian, International ASLA, will cover how the Eco-City concept has evolved with increased urbanization and rapid globalization. The symposium will be held April 7-8 at the University of Washington’s campus in Seattle. General registration is $30. Learn more about the program and register. Also, for those in the Washington, D.C. area: check out the Society of Ecological Restoration’s Mid-Atlantic conference, “Brave New World: Working with Emerging Ecosystems.” A group of landscape architects, ecologists, biologists, and conservation scientists will explore the latest in ecological design. There’s also a set of field tours, including ones for the Anacostia Riverfront, Potomac Gorge, and the U.S. Botanic Garden. The conference will be held April 1-2 at the University of Maryland, College Park. Fees are $105 and $50 for students. 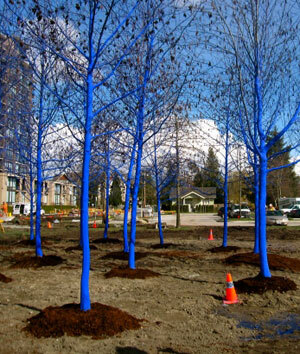 The Vancouver Biennale, a bi-annual public art exhibition that “turns the city into an open-air museum,” is featuring artist Konstantin Dimopoulos’ “The Blue Trees” this year. 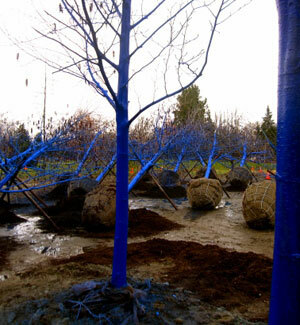 The installation is a set of trees that have received a rich yet enviromentally-safe “temporary colourant” designed to fade gradually over the course of a few weeks. Also, volunteers and loaned paint equipment made the installation fairly low-cost and simple. Egypt-born Dimopoulos is based in New Zealand where he has created Pacific Grass, a wind sculpture, as well as his well-known rod sculptures. Also, check out some of the other public art on view in Vancouver. Image credit: (1) Vancouver Biennale blog, (2) Konstantin Dimopoulos, (3) Vancouver Biennale blog. 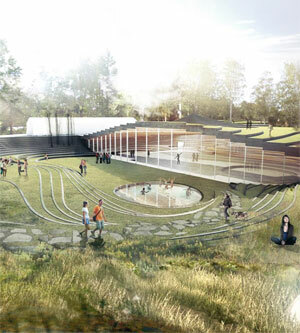 Danish architect Bjarke Ingels, perhaps one of the youngest architects to get the “starchitect” label, is creating a model of biophilic design with a new sports center in Umea, Sweden, which will be set in an “open landscape where the inside and outside meet seamlessly.” Preserving the natural lines of the site located in the Umedalen Sculpture Park, Ingels will use the area’s “natural bowl-shape” to create a dramatic 4,600 square meter ice rink, amphitheatre, restaurant, and outdoor cafe. 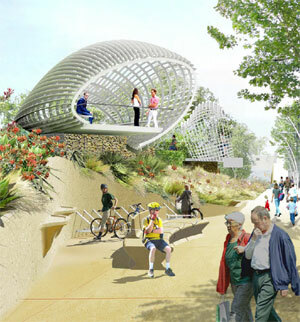 BIG let the natural elements of the existing site dictate the design. 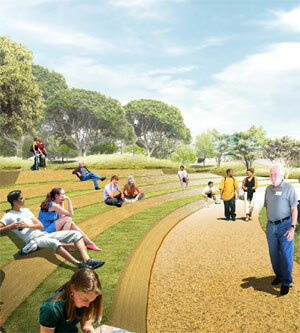 A natural recess that offered “people a nice place to hang out and enjoy the nature” was effectively cut into two. 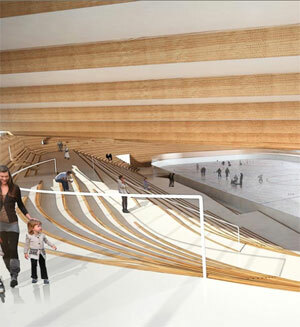 The south half was then used to create the new ice rink. 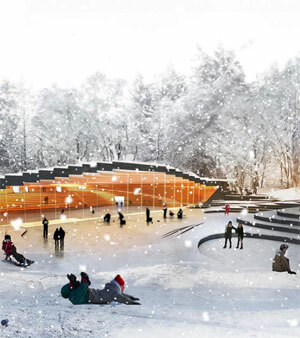 “By splitting the recessed area into two, we can sweep the program under a green roof, the latter becoming part of the sculpture park.” The rink’s green roof will serve an extension of the surrounding landscape, blending hidden structural and natural elements. 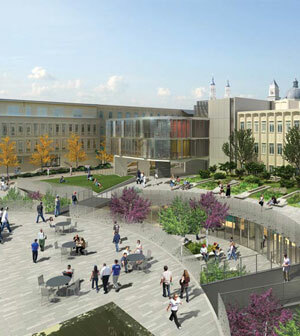 Given this center is supposed to be an “accessible landscape” in all seasons, the design for the wheelchair ramps were built into the early concepts. See more images of the new design. Also worth checking out: Ingel released plans for a new waste-to-energy power plant that will also function as a ski slope. Multi-use infrastructure projects like these show how otherwise-unwieldy infrastructure can be better integrated into communities. See his new TED talk as well. Watch an animation from ASLA’s Designing Our Future: Sustainable Landscapes online exhibition that explains how to use the landscape to reduce the energy consumed by a typical suburban home. 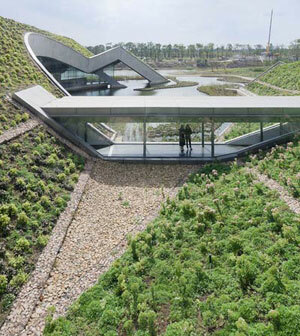 See how smart tree placement and green roofs and walls dramatically improve energy efficiency. Trees are being cut down to make way for new single-family homes, which then often sit on bare lots. These treeless lots not only have negative impacts on the climate, environment, and community health, but they also exacerbate the energy inefficient practices found within homes. This is a major problem given the average American home consumes 70 million BTUs annually. In fact, taken together, American homes account for 22 percent of total energy use as well as nearly 22 percent of carbon dioxide emissions (1.19 billion metric tons). McKinsey & Co, a management consulting firm, found that energy use in the U.S. could be cut by 23 percent by 2020 by implementing simple energy efficiency measures. While homeowners can take low-cost steps to make the inside of their homes better insulated and therefore more energy efficient, the landscape isn’t often seen as a part of the problem… or the solution. Basic green technologies like smart tree placement and green roofs and walls can be used to dramatically reduce energy usage inside homes. If placed strategically, trees can reduce summertime cooling energy needs by 7-47 percent and wintertime heating needs by 2-8 percent. In addition, well-designed residential green roofs, which are growing popular in some parts of the world, can reduce energy usage in both summer and winter. According to one Canadian study, a 32,000-square foot green roof on a one-story commercial building in Toronto reduced energy usage by 6 percent in the summer and 10 percent in the winter. 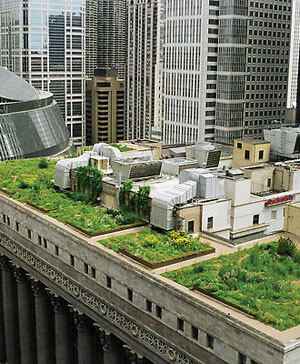 Similarly, the green roof of the American Society of Landscape Architects (ASLA) at just 3,000 square feet reduces energy usage by 3 percent in summer and 10 percent in winter. 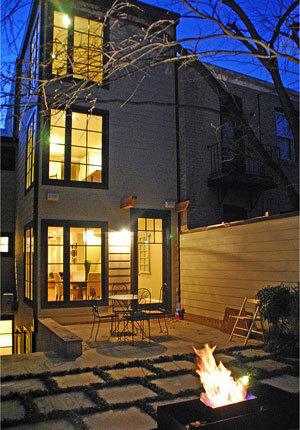 Weather, roof, and building size and location also have an impact on the amount of energy savings. Lastly, fast-growing green walls can also reduce energy use by providing insulation in the winter and limiting direct sunlight on walls in the summer. In hotter months they also cool air temperatures by up to 10 degrees.